What was your background and how did you get into writing? My background is in engineering—I have a Ph.D. from Vanderbilt University. As I was finishing that, I started my own business and became an entrepreneur, but I’ve been writing fiction ever since I was a teenager. I’ve done all kinds of different types of writing—press releases, newsletters, academic papers, advertisements, user’s manuals, and of course my thesis and dissertation. All of that helped with fiction writing. And of course the marketing experience I had owning my own businesses also helped in crafting books that I felt inspired to write but would also sell. Seriously, I suppose I would like to see some of my books be successful enough and widely enough read to be made into Hollywood movies with A-list actors. A lot of different writers inspire me—Thomas Hardy, Stephen King, Nora Ephron, Rod Serling, and David Mamet to name a few. Your books are really detailed on the ins and outs of law enforcement and different job roles, how much research goes into writing them? Where do your ideas come from? A lot of research goes into every book. I spend many hours reading relevant media articles, blog posts, travel websites, law enforcement procedures handbooks, etc. Sometimes I travel to a place specifically to do research—for example, I went to Washington, D.C. and toured the Bureau of Engraving and Printing, where U.S. paper money is made, for the fist Lust, Money & Murder books. I also often query experts, usually via email or the social networks, such as former Secret Service agents or lawyers or doctors or coroners when I have a specific question and can’t find the answer. My ideas usually come from something I see in real life and my imagination takes over when I ask “What if?” type questions. 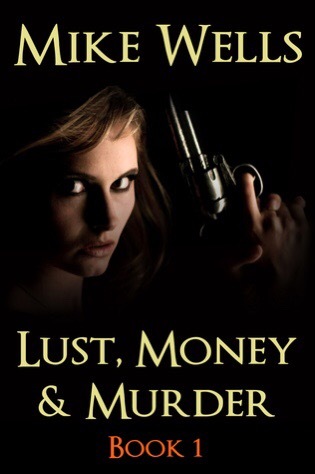 I’m always working on something new—right now that’s Lust, Money & Murder Book 10 – Black Widow, and I’m also working on the outline for another book. What do you use to do your writing? Pen+paper, computer, typewriter etc. I mostly use an iPad with an external bluetooth keyboard because it’s so light and I can take it anywhere. I do a lot of writing outside of the house—at the beach, at cafes, etc. I use Apple’s Pages app and then at the end convert to MS-Word for uploading to publisher websites. Would you ever consider writing in a different genre or is there a genre you wish you could write? I write in a lot of different genres already—YA science fiction, YA adventure—I’ve even published a romantic comedy called Secrets of the Elusive Lover. To me, genre is mostly setting and plot structure. It’s not that hard to switch genres if you spend some time studying that genre and understand what the reader expectations are. At the end of the day, great stories are about interesting conflicts between people, and between ourselves and our inner demons. Genre is secondary to that. How often do you write? Do you set yourself a word target or just go with it when inspiration strikes? What sort of publishing route did you choose and why? I spent quite a few years with some very good NYC and London agents trying to sell my work, and they were never able to do it without me having to make some major compromise that I wasn’t willing to make, so I never sold a book that way. With the advent of ebooks, I saw a way to reach readers myself and bypass that system and produce my books exactly the way I want them to be, so I went for it. How do you market your books? What have been your marketing successes and failures? I use lots of different methods to market my books, but the main one is social media, and primarily Twitter. One of my failures was setting up my own ebook store. That didn’t work because I learned that people don’t want to set up a new account just to buy one author’s books. Also, there was a lot more customer support required having my own store, so I closed the store and decided that it was better to let Amazon, Apple, B&N, etc. handle all that for me. If you could be the original author of any book what would it have been and why? For me, this question doesn’t apply, because I think every author who is writing from the heart could not have ever written any other author’s book—it’s impossible. I’ve never wished I’d written any other author’s book maybe because I know that. To want to do that is like not wanting to be who you are, not appreciating your own uniqueness. I like Mike Wells just fine and I’m very happy with every book I’ve published. If not, I wouldn’t have published them, and there are quite a few of mine still in the drawer which I don’t think are good enough (yet). What are your views on good and bad reviews? How much do you think the success of books relies on reviews? I’m not sure the success of a book is that closely tied to the reviews. I’ve seen some bestsellers that have pretty mixed reviews, if not flat out bad reviews. Very often the reviewer has the wrong expectations for the book in terms of the genre or sub-genre. For example I have had some bad reviews of Lust, Money & Murder particular written by science fiction reviewers. Why they decided to review that book is beyond me—it’s not science fiction and not advertised that way. But of course if you think it’s science fiction and were to read it with those expectations, it would be terrible! Thanks so much for taking the time to interview me, Leonie, I’m honored! Thank you so much for taking the time to be interviewed and answer my questions Mike, the honour is all mine! Why hasn’t any Hollywood director got in touch with Mike Wells to make a series or better yet I could easily see his book series, Lust, Money and Murder be made into many big screen movies like Mission Impossible or James Bond. He is absolutely fabulous. I am on book 10….how many authors do you know that can keep the story line going for over 10 books. Great Job!